With the coming of the Nazi era, Adolf Hitler harnessed the power of music as a part of his master plan, but it was actually Josef Goebbels who ensured that National Socialism adopted it as a part of German daily life through the semi-professional bands of the 'brown-shirted' Sturm-Abteilung and the enthusiasm of the nation's youth. Whilst the 'Horst Wessel' song was the most recognisable in the history of Nazi Germany and it's faithful 'S.A. Stormtroopers' and synonymous with the Third Reich as its unofficial German National Anthem, Hitlerjugend musical education was originally centred around the traditional German folk song. However, still being essentially a political and ideological organisation, like the SA, more emphasis was eventually placed on solemn military and fighting songs, through which the ten-to-eighteen year olds could re-affirm their commitment to their leader and Fuehrer, Adolf Hitler, and his ideals! 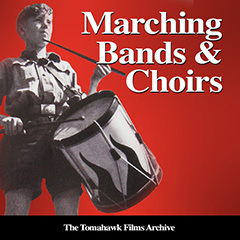 This was to result in the youngsters, (whose lusty singing & marching was a world away from traditional German military music), taking a rebellious pride in the fact that all their early activities were performed without any help from the experts, rejecting the 'know-it-all' attitudes of their S.A. musical peers! Gradually the Hitlerjugend evolved into a powerful political youth organisation whose leadership began to control every aspect of music and gifted youngsters were sent to the Musikschulen für Jugend und Volk and from this early 'rag-tag' musical education of S.A. street-fighting songs would come many talented future Wehrmacht and Waffen-SS military bandsmen, conductors and musical directors.